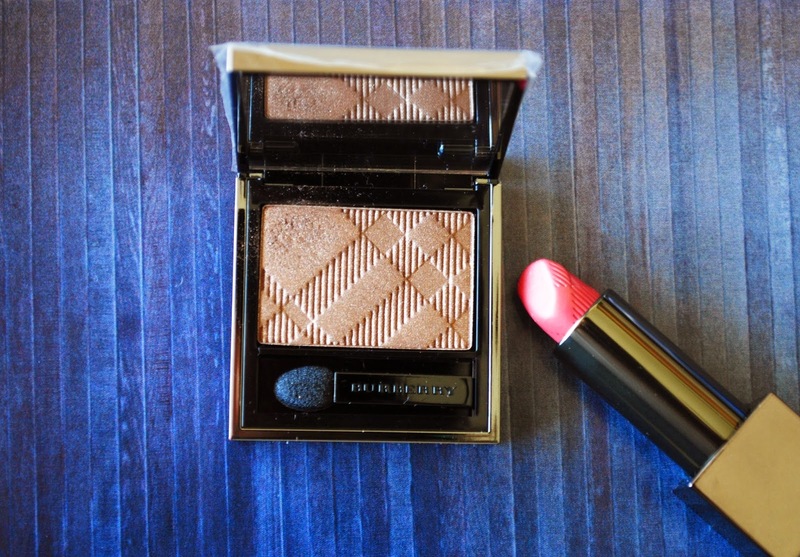 I own a few makeup bits from Burberry and I love them. One thing that I didn´t have and I have been wanting for a while was a lipstick I just wasn´t finding the right shade, they have amazing bold shades, that are on top of my wishlist, but for my first lipstick I wanted I shade that I could wear on an everyday basis and I think I found it in this shade No.09 Bluh, it´s a rosey pink shade ( it looks lighter in the photo) it´s a darker pink then I normally go for but at the moment I´m liking it. My plan was just to buy the lipstick but as usual I ended up buying another eyeshadow, but to quote Rachel Zoe "I thought it was good I left with 2 things instead of 10"!!! I already own Pale Barley, that I love, but when I saw this shade No.21 Midnight Brown ( again it looks lighter in the photo it´s actually quite dark) I couldn´t resist, it´s a cool tone dark brown with shimmer, when I swatched this in the store It looked more warm toned ( which I prefer, I think I suit warm tones better than cool tones) maybe it was the lighting, but I still like it for when I do a brown smokey eye. Like Tim Gunn says Make It Work! Ps: Massive Fail I forgot to take the plastic thing from the eyeshadow. Oh well!